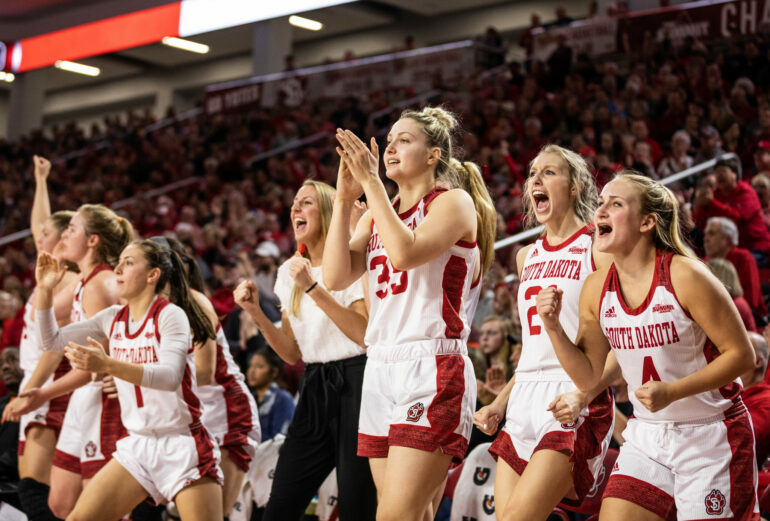 Led by Ciara Duffy with 17 points, five Coyotes reached double figures in a 80-49 victory over Omaha Sunday afternoon in Baxter Arena. The Coyotes (17-3 overall, 5-1 in the Summit) never trailed in the game, not even allowing the Mavericks to once tie. With the win, the Coyotes tie South Dakota State for first in the conference with just over a month to play and a trip to Brookings still to come. Madison McKeever scored 14 points and six assists. Allison Arens became the sixth Coyote to have 1,000 points and 300 assists over her career. Arens finished this game with 12 points and five assists. Taylor Frederick and Hannah Sjerven each tallied 12 points. USD held a six point advantage at the end of the first, but from there on the Coyotes dominated. By halftime, the lead had grown to 13. They finished the game 10-of-19 from three. The largest lead of the game was 31 points late in the fourth quarter. USD’s defense forced 21 turnovers and held the Mavs to 39.1 percent shooting (18-of-46) from the field. On the other side of the coin, the Coyotes shot an effective 56.6 percent (30-of-53) and only committed 12 turnovers. The Coyotes converted 28 points off turnovers and scored 34 of their 80 points in the paint. The Mavericks (6-12, 1-5) were led by Rayanna Carter and Mariah Murdie’s 12 points each. Josie Filer added seven points and six rebounds. The Coyotes were able to out-rebound (23-22) the Mavericks. Omaha found a good contribution from their bench, outscoring the Coyotes bench 20-18. The final leg of this three game road trip is in Grand Forks, North Dakota against the newest team in the Summit League conference. USD will take on North Dakota (8-12, 3-4) at 7 p.m. Thursday.